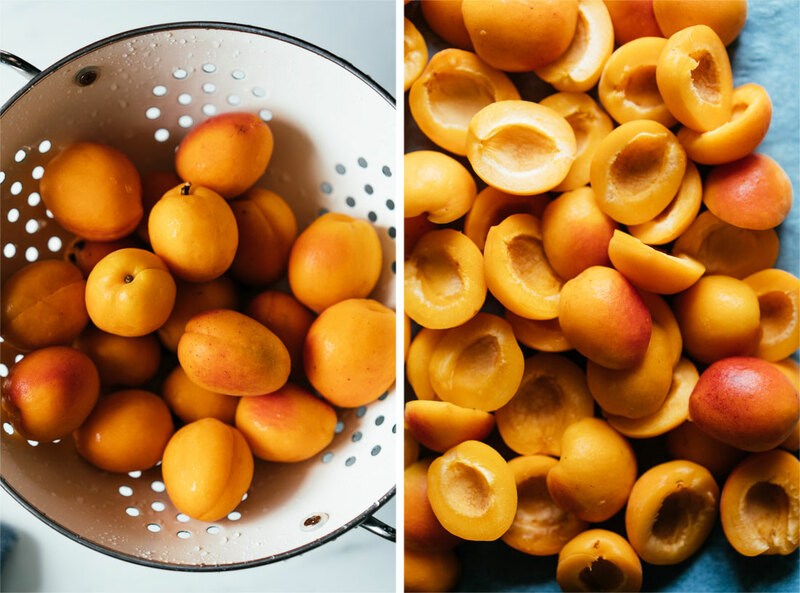 A couple of weeks ago Rob and I bought a punnet of apricots. Unfortunately the ones we got were rather on the dry side so I decided I should try to make them into something we actually want to eat. 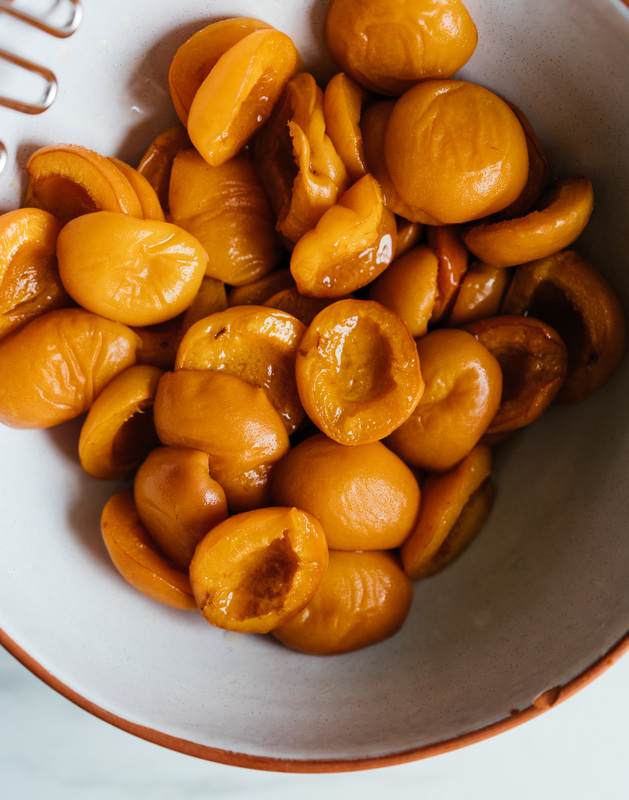 Flipping through a book I received from my mother for Christmas last year I saw some roasted apricots and thought: ‘this is the answer to my questions’. This sounds a little dramatic and it really wasn’t but it’s more fun to write that way. 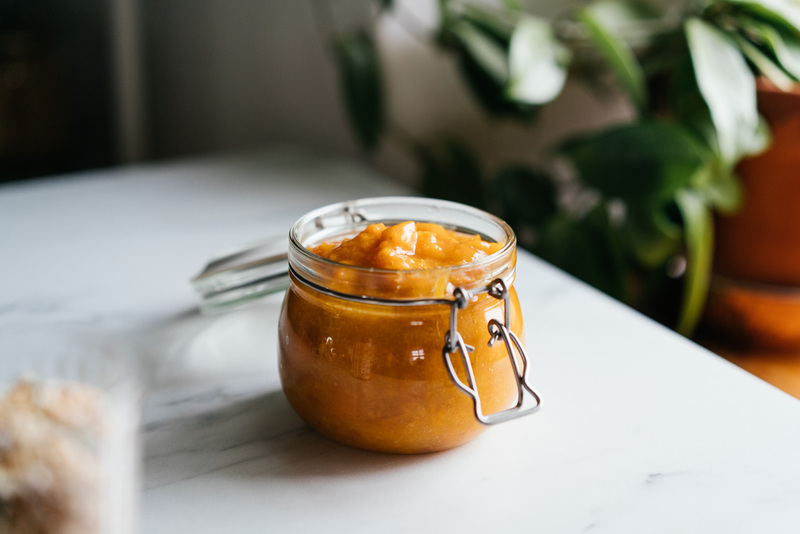 Anyhow after roasting the apricots drizzled with a little brown rice syrup I finally decided to make them into a compote of sorts; roasted apricot compote to be more precise. It ended up being very easy and quick and most of all very tasty. And the punnet we bought which initially disappointed us now become a valuable asset in our fridge as we used it to top off our breakfasts. 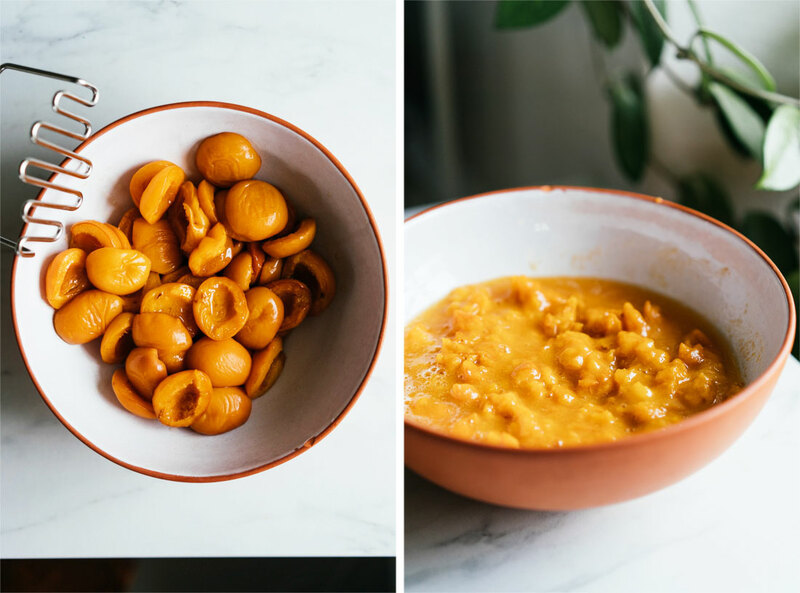 It’s great with oatmeal or over night oats and other kinds of porridge. 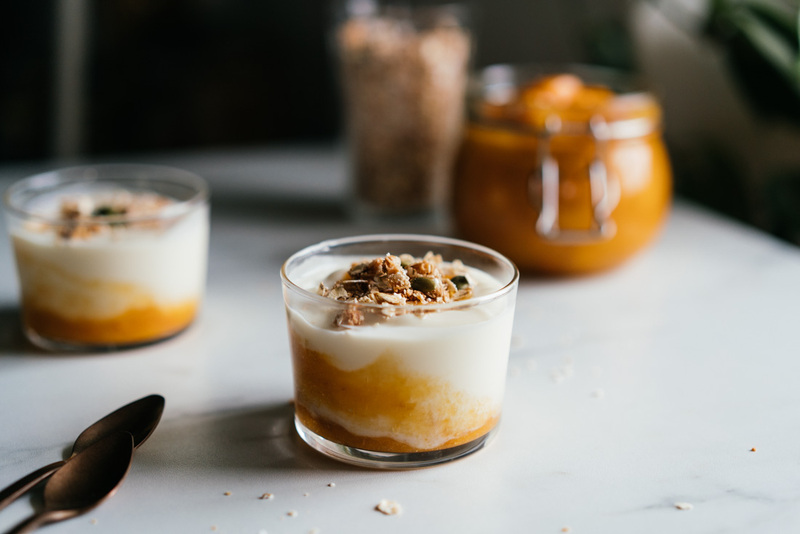 With granola and oat milk or the way I chose to present it to you here in this post; as a yoghurt parfait topped with an equally simple (yet tasty) muesli. I see so many beautifully swirled breakfasts in glasses in my instagram feed and on blogs that I just couldn’t help myself but to try it for myself now that I had something to swirl with. I think it is such a beautiful effect which makes the food look more festive and makes it fit for any breakfast gathering. To produce this smudged swirly effect you simply start by layering your compote and plant yogurt. You could do several layers if you are using a tall glass but as mine was quite stumpy I did just two. Then using a spoon or a table knife swirl the two together towards the edge of the glass as you pull your utensil upward incrementally. Play around until you are satisfied with your result but don’t go totally wild as it might just end up all one colour if you overdo it. 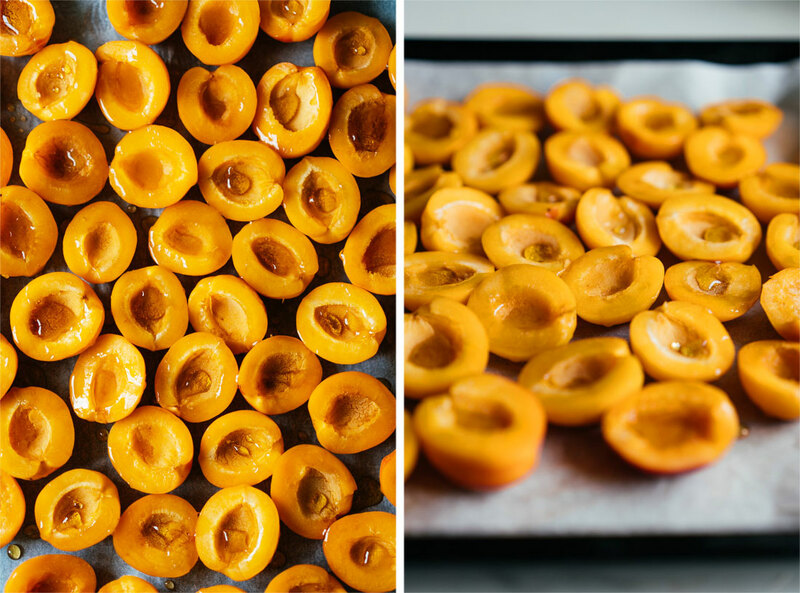 Place your halved apricots cut side up on a lined baking tray. Drizzle the brown rice syrup over them and sprinkle with a pinch of sea salt. Roast in the oven for 15 minutes or until tender. 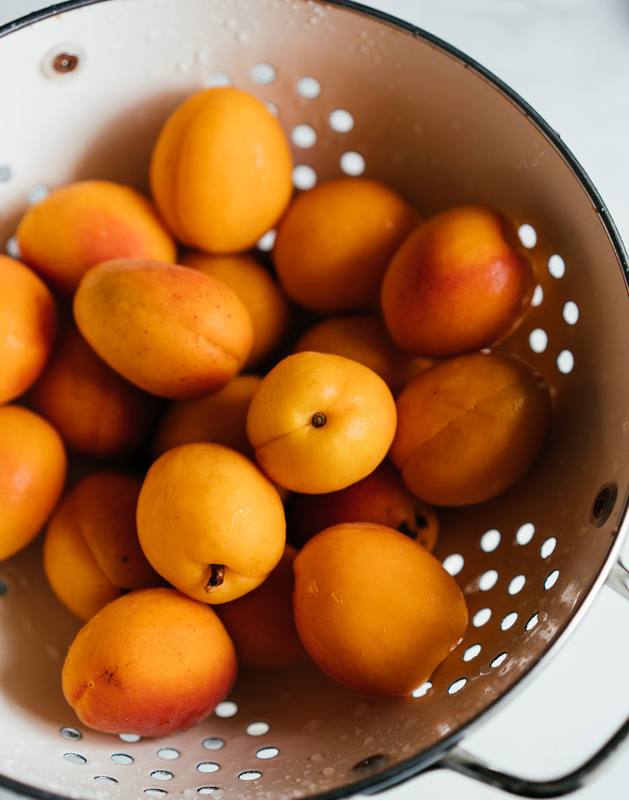 When your apricots are finished roasting place them in a mixing bowl and mash them gently with a potato masher. 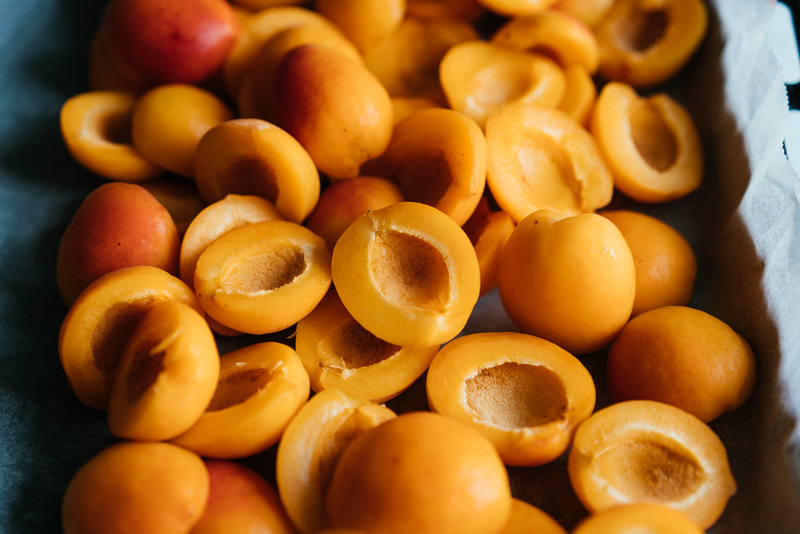 Once the apricots have released quite a lot of their juices I like to take a pair of scissors to cut up the skins and what’s left of the fruit into small pieces. 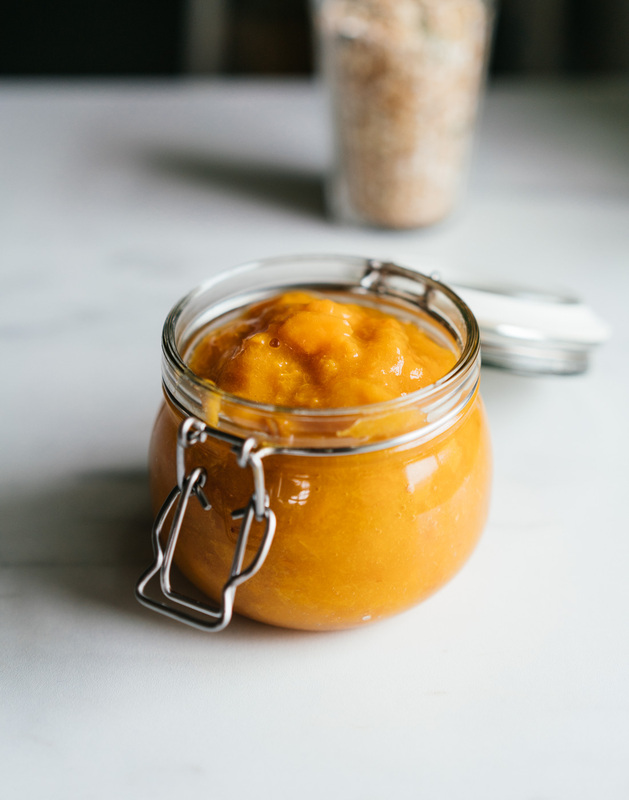 Let cool and keep refrigerated in an air tight container for roughly a week. Mix your rolled oats and desiccated coconut in a bowl or straight onto a lined baking tray. Drizzle with brown rice syrup and add cinnamon if you wish. Mix the syrup in well using a fork or your hands and then toast in the oven for 10 minutes or until slightly golden. Let your oat and coconut mixture cool off for a few minutes and then mix in your puffed grain as well as pumpkin seeds. Store in an airtight container for roughly two weeks. 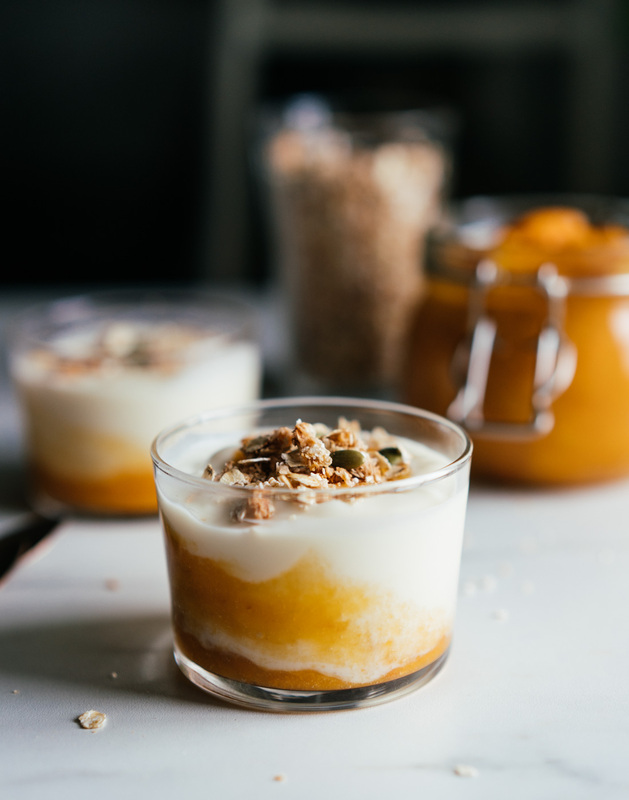 Layer your compote and yoghurt in a small glass and top it off with your muesli. 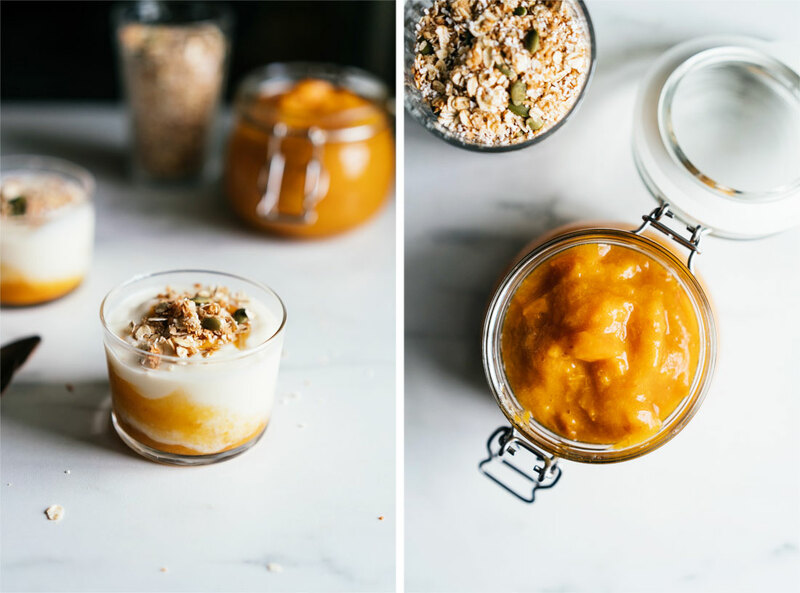 Prepare in jars and refrigerate with the muesli in separate packs for a quick on the go breakfast. what a lovely compliment, thank you maria!